In the summer of 2015, my husband and I decided to move to Lisbon without ever having visited here. Still in California at the time, we knew we were coming back across to Europe, and we had a wish list. We’d been to Portugal exactly once, well over a decade earlier, and at the time found ourselves so bewitched by Sintra that the day we’d planned to come to the capital, we devoted instead to more wandering around Sintra. (If you’ve ever been there, you’ll understand how this could happen. It’s a stunning little town filled with castles set on wooded hills, in a microclimate all its own.) 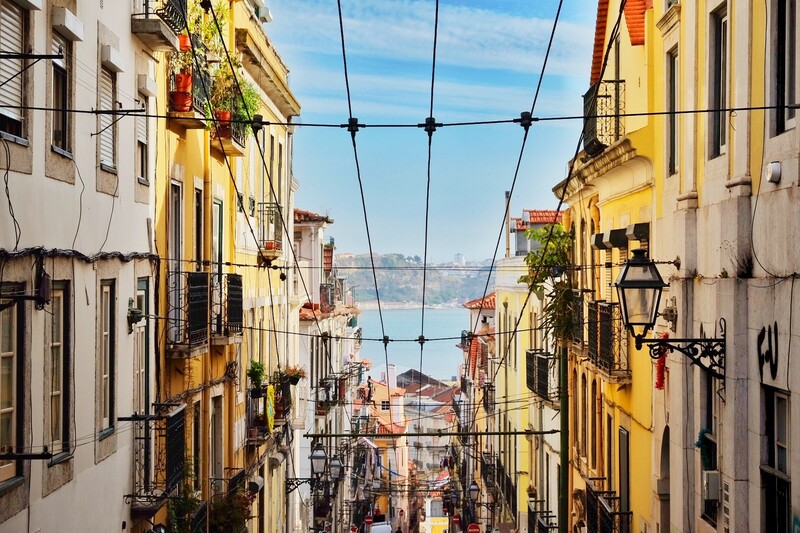 We’d heard and read how gorgeous Lisbon was (it still is! ), but simply ran out of time on the way to a wedding up near Viseu (central Portugal). Thus it was that, all those years later, we found ourselves committing to move here, sight unseen. Our wish list wasn’t especially long as these things go. It had to be a major city with good air connections to Zurich (for work purposes) - these days, that’s a lot of cities! Narrowing the choice quite a bit, though, was our weather requirement. Living in California for 21 years had spoiled us, so anywhere north of the Alps (just for starters) was out of the question. We’ve both had more than our share of cold, gray winters, and we’d got used to the idea that if we wanted to play in the snow, we could go to the snow rather than letting it come to us. There had to be a variety of cultural pursuits available, and it had to be visually attractive. Walking as transportation is one of the joys of city living, and all the more so if the urban landscape makes your heart sing. Lastly, but importantly, it had to be affordable. You might think that language would be part of this equation. Between us, we speak intermediate Spanish, French and German, and undoubtedly having a head start in the local tongue would be an advantage. And perhaps, all else being equal, if we’d found we couldn’t decide between two cities and one was in a place where we knew the language already, it might have mattered. But we both (and I in particular) enjoy learning languages, and we knew that in the long run, even if we had to start from scratch, that wouldn’t be a serious obstacle. (And it wasn’t - but more about how we began to study Portuguese in Portugal in another post!). Lisbon came out on top of our wish list right from the get-go. We mulled things over for quite some time, and occasionally we’d latch on to one city or other, perhaps after reading about it in the weekend newspaper’s travel section. What about *that* city? Should we maybe go *there*? Inevitably, though, there’d be one or another aspect where, for us, every other city fell short. Meanwhile, we recognised one thing in particular that Portugal had, that not every European country has: centuries-old borders. This has implications for the country’s modern-day cohesion *as* a country, which, if you’re thinking in terms of possibly living in a place for decades, matters a lot. It wasn’t a done deal until we actually came here for the first time, of course. If we’d arrived and found that, as good as it all looked on paper (or in pixels), the vibe just wasn’t right, we could certainly have changed our minds. The plan was to see a lot of apartments in our price range, and also to do some sightseeing and exploring, to see how we felt in our prospective new city. We’d done our homework and arranged meetings with a law firm and two real estate agents, and at the end of two weeks we’d probably seen 20 apartments. It was obvious after just a few, though, that having sold a house in the San Francisco area, what we could afford here was going to be very nice indeed. And we fell in love with the city right away. Our first short-term rental was in Alfama, a sweet little place in an old building with a jaw-dropping view. The apartment owners, some of the first Lisboetas we ever met, couldn’t have been nicer and the experience set the tone for our whole two-week stay. After a weekend in the walled city of Obidos, we stayed in an apartment on the border between Alfama and Baixa, near the Sé (cathedral). It was during this time that we were shown the apartment we live in now. It’s in the Lapa neighbourhood, a quiet area that’s still not far from the city centre, and from one side it has views of the 25th of April Bridge, the Golden Gate’s twin sister! It has plenty of space (evenincluding a maid’s room and bathroom, which the sellers, who had three kids, actually used for their live-in maid…we use it for storage), and the sellers were also offering to take over the lease of a garage space nearby. The building is quintessential Lisbon, with moulding details on the nearly three-meter ceilings, traditional windows, and in our street there are still those older ladies keeping an eye on everything from their apartment windows (an excellent neighbourhood-watch system if ever there was one!). I think it was the view of the bridge that clinched the deal for me, though the spaciousness of the apartment was definitely a factor too - the apartment is nearly as big as our house was in California (a Craftsman, not a McMansion, to be sure). And of course, our new home has been the perfect base from which to learn and study Portuguese in Portugal! Two and a half years later, we couldn’t be happier here. We’ve got to know many of our neighbours, especially in our building, and the old lady across the street calls me ‘filha’ (daughter) now. When I broke my foot last November, I had more offers of help than I could possibly accept. And even though (as is the case whenever you move house) it took several months after moving (as well as quite some time before!) to accomplish all the official details, I often found myself walking to some appointment or other, ruminating on whatever task was ahead, but then looking around and thinking, “but look where I am! What a beautiful place I live in!” And it’s true, because Lisbon is an easy city to love. The pastel buildings built on hills that make each view like a postcard; the famous warm, soft light; the incredible Portuguese food made with beautiful local ingredients (go to a shop and you’ll see: most of the produce is labeled as “origin: Portugal”); the museums, galleries and sweet little shops; and most of all, my new neighbours (in my own neighbourhood or further afield in this lovely city), the people of Lisbon (Lisboetas). (It must to be emphasises that the kindness of the Portuguese people is one of the aspects that make it so pleasurable to study Portuguese in Portugal.) Yes, if I had it to do all over again, I would do exactly the same thing.